There's been an explosion of interest in digital recorders of late, and hybrid models that feature the flexibility of both DVD and hard-drive recording have proved the most popular, but the market still has space for standalone recorders. Panasonic's DMR-EZ27 offers effortless recording to any software format and then polishes up the results to 1080p resolution using sophisticated upscaling technology. Since the emergence of hi-def displays, devices with built-in video scaling are nothing special, but not all can upgrade DVDs, recordings and even TV broadcasts to1080p. it comes close and is the easiest and most affordable way of enhancing your existing content. Upscaled images are supported by an HDMI digital video output, which is accompanied by a cast of analogue alternatives including progressive scan-compatible component outputs and two Scarts. The latter have been enabled to either output or input RGB signals, allowing you to record from a separate device without compromising quality. There's also a set of easily accessible AV connections concealed beneath a flip-down panel at the front, including a DV input for digital camcorder users. The digital tuner claims to support stable signals with reduced blocking even in poor reception areas. Unfortunately, there's no accompanying CI card slot for receiving limited subscription channels or the memory card support offered by earlier Panasonic incarnations. You can still access and organise digital music and photo files stored on discs, but there's no support for DiVX files. Multiformat compatibility means you can record to every DVD format under the sun including dual layer (DL) discs. DVD-RAM is generally preferred for its flexible editing features and time slip functions such as chasing playback and simultaneous play and record. Typically, there's a choice of four recording modes (XP, SP, LP, EP) that trade time length for overall image quality. Using the standard SP mode gives you 2hrs of footage on a standard disc, rising to a choice of either 6 or 8hrs using the lowest quality EP mode. There's also a useful FP mode that automatically selects the best mode according to the remaining space on the disc. Finally, there's a decent range of post editing features that let you name, change thumbnails, delete and divide titles into chapters, from which you can then create playlists. The remote's spacious arrangement and oversized controls mean it's less daunting and easier to use than most typically overcrowded units. 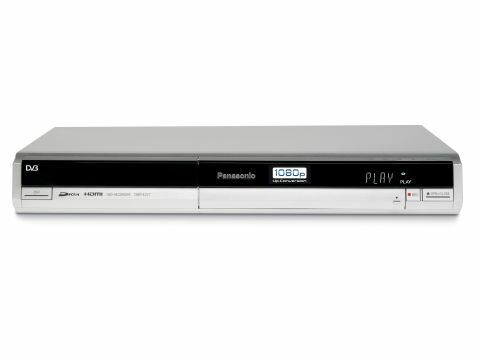 This recorder also features the latest Viera Link technology, which allows you to control and access the menus of a variety of Panasonic's products from just one remote. The three main menu systems - Functions Menu, EPG Guide and Direct Navigator - can be instantly accessed using short-cut keys on the remote. The menus are colourful and very easy to navigate. The simplest way of making recordings is using the 7-day EPG, since all you have to do is select a programme and leave the rest to technology. Our only complaint is that there are no moving thumbnails or sound to keep you entertained while you scan EPG listings. The Direct Navigator system does use thumbnailed images to help identify recordings, though, and you can also name titles using an efficient virtual keyboard. Editing features is eased by an intuitive system that helps you rapidly find and revise footage using well-structured steps that even digital recording virgins will be able to follow. Recording performance is always dictated by the quality of the integrated tuner and we found the DMR-EZ27's broadcast images to be impressively stable, detailed and cohesive, especially when they're upscaled. Most HD Ready screens will accept 720p and 1080i images, but if you want to scale the heights of 1080p, you'll need a Full HD (1,920 x 1,080) screen. Using both the XP and SP modes produces recordings that are virtually indistinguishable from the original. There is a slight softening of edges using the SP mode, but it's fine to use for all but your most precious archived recordings. However, video nasties such as shimmering edges, background instability and stuttered movement do raise their ugly heads, especially if you're forced to use the lowest quality EP mode to cram 8hrs of material onto a disc. Upscaled DVD playback is impressive with dense black levels encouraging explicit detail and depth-defining contrast, although there is some loss of definition in dark scenes during gloomy films such as The Prestige. Colours are beautifully balanced and natural, while picture noise is banished to outer backgrounds and the occasional shadow gradation. Cohesive movement can struggle with slow camera pans, but fast paced action is generally fluid. As with all DVD decks, the digital audio performance is dependant on the quality of your TV or external home cinema system rather than the deck itself. The analogue audio via Scart, though, is rather flat and we'd recommend availing yourself of the HDMI output if possible. The price is fairly high for a disc-only recorder, especially since that £250 could get you a hybrid model with both DVD and integrated hard-drive recording. Build quality is only average, too, and the design is dull. But the cost is ultimately justified by a futureproof spec, fuss-free usability and outstanding picture performance with both DVD playback and recordings.